As Bethesda gears up to release Fallout 76 later this year, fans of the Fallout series have expressed disappointment that the first multiplayer game in the franchise won’t have a typical singleplayer RPG quest structure. While Fallout 76 focuses on players allying and attacking one another in their own raiding groups, the game will lack traditional non-player characters and hubs that singleplayer Fallout fans enjoy. So while new Fallout content from Bethesda will be something different this year, it’s worth turning to Fallout 4’s talented mod community to see what’s in the works along those more traditional post-apocalyptic RPG lines. Though a number of smaller, essential tweaks and overhaul mods are worth checking out, for this roundup we’ve decided to look at some of the mods that are more ambitious in scope – mods that intended to add DLC or expansion-sized content in brand new areas that we haven’t seen represented in the Fallout universe before. One of the most exciting prospects when Bethesda announces new Fallout content is seeing how different areas on the United States are represented – but there’s also plenty of lore out there about land masses we haven’t seen before, so these mods take that information and run with it. Look forward to these massive projects coming out this year and beyond! Welcome to the Pacific Wasteland - revisit old gameplay systems from previous installments of the Fallout franchise such as skills, the dialogue system and much more, explore new locations and delve into the massive ruins of downtown Seattle in the biggest modern Fallout map ever created, and who knows, maybe make a trip into Cascade, the grand capital of the region. Fallout Miami is an upcoming DLC-sized mod for Fallout 4. The Miami team & project lead Mika999 is working towards a new landscape, items & quests! A Fallout 4 mod based in Post-Apocalyptic Philadelphia and the surrounding area. Fallout 4: New Vegas aims to recreate Obsidian Entertainment's Fallout: New Vegas in Fallout 4's Creation Engine, with all of the original quests, story and content, with additional gameplay elements and systems from the new and improved engine! 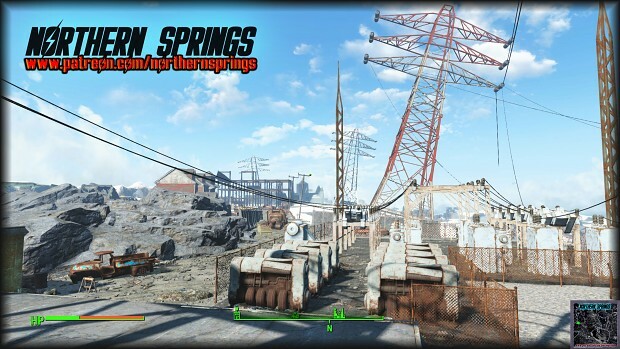 Northern Springs is an upcoming Fallout 4 Mod for the PC & possibly the XBox One. It introduces a whole new worldspace that expands beyond the Commonwealth into the deep forests of Northern Massachusetts. Adds, several new location settlements, factions, weapons, quests and much more!